Miguel Angel Velasquez, Peruvian Consul General, has lived in Seattle for the past fifteen years. About eight months ago, he helped start a walking group, the Inca Walkers, who stroll together for an hour every weekday morning. During the winter the group walks in Northgate Mall, and during the warmer months they walk around Green Lake. The walkers, who also share health information including healthy recipes, have enjoyed noticeable health benefits including weight loss and increased energy. According to Mr. Velasquez, the daily walk provides the group with “an hour of physical and mental health.” In addition to health and social benefits, walking in a group provides the Inca Walkers, many of whom are women, with a sense of safety. Mr. Velasquez says that while walking for transportation is very common in his native Peru, which has a strong walking culture, that isn’t the case here in Seattle. As they walk, the group does not permit any negativity-only positive discussion is allowed. Group members monitor each other and provide reminders to keep the tone upbeat should anyone veer into negativity, which according to Mr. Velasquez has worked well so far. 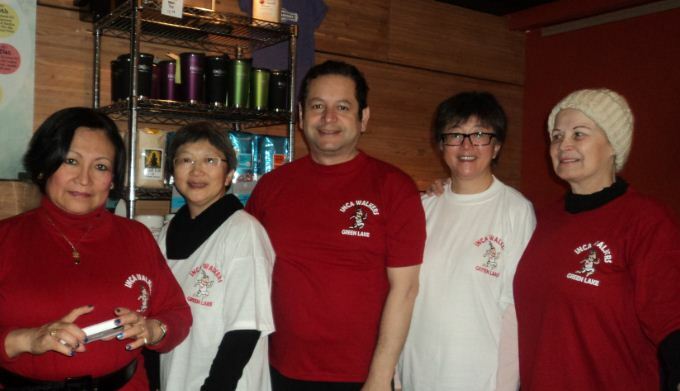 The group creates unity by donning a uniform of matching T-shirts. New members who join the walk for multiple days in a row receive a T-shirt, in addition to being taken to breakfast by the rest of the Inca Walkers. Group members frequently call each other in the morning before walking to encourage each other, which keeps them motivated. Several group members use pedometers to track their progress, frequently sharing this information on Facebook. Inspired to stroll with others? Join the Feet First Walks Meet Up group, where you can find others who enjoy walking in your neighborhood. If you don’t see a favorite walk, become a Neighborhood Walking Ambassador and lead a walk for others.